Amber Lakin (front) and colleague Julia Porras work at Central City Concern, an organization that does outreach and job training to combat homelessness and addiction in Portland, Ore. Lakin went through the welfare system and now works with Central City Coffee, an offshoot of the main organization, which uses coffee roasting/packaging as a job training space. 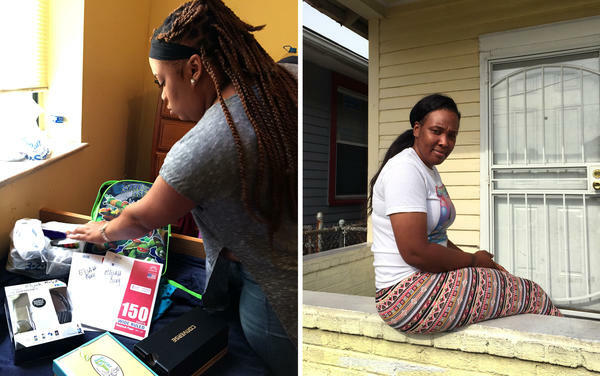 (Left) Danielle Molett sorts through school supplies she purchased for her three children, a cost that absorbed most of that month's welfare check. (Right) Natasha Williams on the porch of her apartment in New Orleans. Last year, she was homeless and lived in her car, but she still didn't receive welfare. Lakin is enrolled in JOBS Plus, filling orders and arranging deliveries for a coffee roasting business in Portland. Twenty years ago, welfare as Americans knew it ended. President Bill Clinton signed a welfare overhaul bill that limited benefits and encouraged poor people to find jobs. "We're going to make it all new again, and see if we can't create a system of incentives which reinforce work and family and independence," Clinton said at a White House bill signing ceremony. The goals were admirable: help poor families get into the workforce so they'd no longer need government aid. They'd get job training and support, such as help with child care. But the results have been mixed. The new program did work for millions of families, but not all. Many of the most disadvantaged people have been unable to get or keep jobs, and they're worse off than they were before, in part because there's now a five-year lifetime limit on welfare benefits — and in some states, it's lower. Arizona this year cut the limit to one year. The idea was that people would be encouraged to find work if they knew their monthly checks would end, but instead, some have been left high and dry. "It turned out that not everybody could get full-time, full-year work," says Kathy Edin, poverty expert at Johns Hopkins University and co-author of $2.00 a Day: Living on Almost Nothing in America. She notes that before welfare reform, 68 percent of poor families received cash assistance. Today, that's dropped to 23 percent. States were also given a lot of flexibility over how to spend their welfare dollars, which they received in the form of a block grant. The result is that welfare — now called TANF (Temporary Assistance for Needy Families) — is very different depending on where you live. Some states, such as Oregon, are more generous. Others, such as Louisiana, have lower benefits and cover far fewer people. In Louisiana, only 4 percent of poor families — 6,000 families in the entire state — now get welfare. "Why look for a job if I already have a job?" You'd think that Natasha Williams would be one of them. A 31-year-old single mother with a 12-year-old son, she's constantly struggling. Her last job — a part-time security guard position — ended in July. Williams and her friends, who are also struggling, are often short on money. Recently, she watched another woman's baby in exchange for food. "Instead of paying me the cash for watching the kid, she just brought me some stuff," she says, pointing to several packages of meat on her kitchen counter. Williams also gets help with her rent for her New Orleans apartment from a nonprofit organization. Last year, she was homeless and lived out of her car after she'd had an accident, lost another job and was evicted. Every night, she'd find a place to stay near Lake Pontchartrain on the northern side of the city. "And I'd just go around it, and ... park somewhere where it was real, real dark," she says. "Just relax, and, well, try to relax, and just fall asleep." So if thing are so bad, why doesn't she get welfare? Williams says it's because it's just not worth it. The benefits are extremely low — $188 a month. And to get them, she says she'd have to take time off from her current job search to go to a program to find out how to get a job. And until last month, she was working, even while homeless. She just didn't earn enough to live on. "Why look for a job if I already have a job?" she says. "Why can't I just get a little help? It didn't really make sense to me." It also doesn't make sense to Danielle Molett, 22, who lives nearby in a shelter with her three children, ages 4, 3 and 2. Molett does get welfare and appreciates the extra cash, but this month it barely covered school supplies, like crayons, markers and notebook paper, that she had to buy for her kids. She still has to get diapers, hygiene products and other necessities she can't buy with food stamps. But to qualify for the aid, Molett says she has to pack up her children, get on a bus and travel to two appointments a week and look for a job — even in the summer when they're out of school. The state gives her some money for transportation and child care but not enough to cover her costs. "It's too much, they asking for too much," Molett says. "Not the most accessible or user-friendly"
Marketa Garner Walters, the new secretary of Louisiana's Department of Family and Children Services, is sympathetic. "We're not the most accessible or user-friendly," she says. "We have to figure out how to meet our clients where they are and how to make the help that we are giving them more accessible and readily available." Walters says one problem is that over the years, welfare spending in the state has been slashed. The law Clinton signed allowed states to use federal TANF funds for things other than welfare. And when state budgets were stressed after the Great Recession, that's exactly what many of them did. "So we now use TANF money to pay for things that are not traditional TANF expenditures," she says — such as early childhood education and other programs that used to be funded by the state. She says her administration is concerned about the state's poor and wants to replenish some of those welfare funds. But Jan Moller of the Louisiana Budget Project is not optimistic the state will be able to find the money. He says welfare became something of a slush fund. The result is that today Louisiana uses only 8 percent of its welfare money on cash benefits for the poor and only 1 percent on programs to help them find jobs. It's one reason benefits are so low. "I think there is a perception among the taxpaying public that a lot of their dollars are being used to let people sit at home and not work, and the reality is that simply isn't true in Louisiana," Moller says. "It wasn't very true 20 years ago, and it's certainly not true today." Ron Haskins, who helped write the welfare reform bill as a GOP congressional aide, now thinks giving states so much flexibility was a big mistake. He says those at the lower end of the economy are worse off than they were before. Often they're single mothers who work part-time jobs and get little or no help from the fathers. They face multiple hurdles, like unstable housing, poor education and debt. Still, Haskins, now with the Brookings Institution, says the law did accomplish a lot, such as helping millions of low-income women into the workforce. And with the help of food stamps and tax credits, their poverty rates have gone down. "More of them now are really committed to work. They like to work, they say they like to work. They don't have great jobs, we all know that, but their families are better off economically, so to that extent, the reforms have worked well," he says. Nationally, there are about 4.1 million people on federally funded cash assistance programs. But Edin says that number doesn't tell the whole story. "Half of those are in just two states: California and New York, meaning that in many states across the United States, there is virtually no welfare system at all," she says. But that's certainly not the case in Oregon, where about 54,000 adults and children live in households receiving TANF benefits. The state also has an innovative job training program called JOBS Plus that's helping welfare recipients find permanent employment. Participants in JOBS Plus get a paycheck for working for up to six months in a job they're placed in. They don't get government assistance while they're working; they're paid by their employers, who are reimbursed by the program. Amber Lakin of Portland, Ore., is enrolled in JOBS Plus, filling orders and arranging deliveries for a coffee roasting business. It's helping her learn basic office skills, with the goal of eventually landing a full-time job. 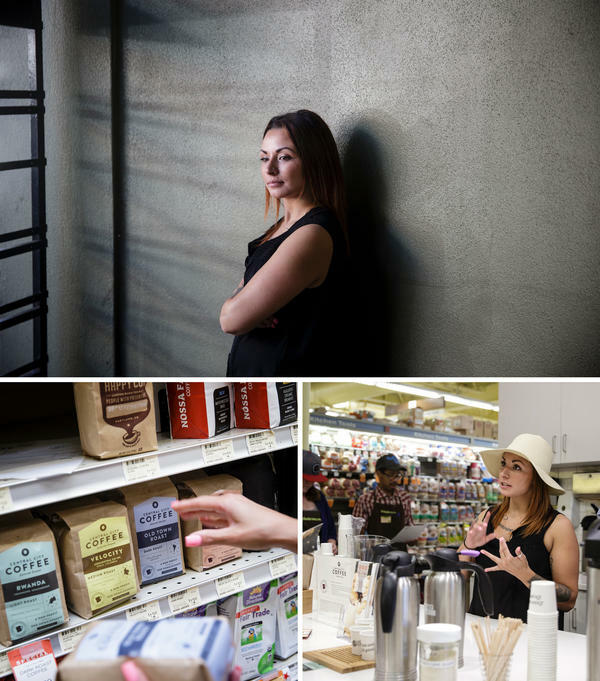 "I definitely make more than my food stamps and my TANF combined," she says. The average TANF benefit in Oregon is $506, among the highest in the country. Lakin says a few years ago she was addicted to meth and trapped in an abusive relationship. She got into a drug treatment program, and also applied for TANF. Lakin credits her case manager with the Oregon Department of Human Services for helping to bring some order to her chaotic life. The agency's Kim Fredlund says developing a meaningful relationship with TANF recipients is one of the program's goals. In fact, the state is no longer calling them case managers. The new job title is "family coach." "A coach's role is really about encouragement. It's about helping to challenge someone when they're struggling with something — teaching them, and really helping them move forward," she says. Fredlund says that Oregon is trying to run the program more like a for-profit business. Case in point: Virtually everyone who walks in the door is helped in 30 minutes or less. The agency's commitment to the program is backed up by state lawmakers. Last year the Oregon Legislature used savings from the drop in caseloads following the recession to raise income thresholds and allow more people to stay on TANF longer. "It's not as bad here as some other states, but we still have a stubborn poverty rate," says Chuck Sheketoff, head of the Oregon Center for Public Policy, a left-leaning think tank in Portland. The state's poverty rate is 16.6, slightly higher than the national average — but nearly half of its families with children in poverty receive TANF benefits. That's well above the national average and one of the main reasons Oregon's venture into welfare reform is considered successful. Chris Lehman is a reporter with the Northwest News Network. Twenty years ago today, President Bill Clinton signed legislation to end welfare as we know it. And that is exactly what happened. Benefits were limited, and poor families were encouraged to find jobs. But the results have been mixed. Some people found work, but others are struggling more than ever. Today, the number of families on welfare is much lower than it used to be, even though deep poverty is on the rise. NPR correspondent Pam Fessler covers these issues and joins us in the studio. PAM FESSLER, BYLINE: Good morning. GREENE: So is there a way to say whether welfare reform was a success or a failure? Or - it sounds like it might be just complicated. FESSLER: Exactly. Those who were able to get steady work - for the most part, they are better off. They not only have some income - even low income - but they also get what's called an earned income tax credit, which has really helped a lot of people out of poverty. The problem is that there's also this large group of people at the bottom, and they haven't been able, for one reason or another, to get or keep jobs. And they're worse off. And that part of the reason is because there is now a five-year, lifetime limit on getting welfare benefits. And in some states, it's even lower, as low as one year. So when a family hits that limit, their benefits are cut off. GREENE: Didn't we always hear that one of the keys to this reform was that states had a lot of flexibility to respond to the concerns of their residents? Has that helped? FESSLER: In some ways, it's helped. But it's also hurt. States get block grants, and there, now, have a lot of control over how they spend this money. The result is welfare is very different depending on where you live. Some states have much lower benefits. I recently went to Louisiana where, today, only 4 percent of the poor families in the state get welfare. That's 6,000 families in the entire state. FESSLER: Where you going, baby? FESSLER: And David, that voice you're hearing now, that's Natasha Williams. And you'd think that she would be one of those who would be getting welfare. She's a 31-year-old single mother with a 12-year-old boy. She's constantly struggling. Her last job as a part-time security guard ended in July. And when I met her, she was in her New Orleans apartment watching a friend's baby in exchange for food. NATASHA WILLIAMS: You know, instead of paying me the cash for watching the kid, she just bought me some stuff. GREENE: Pam, she's babysitting and getting paid for it in food. FESSLER: That's right. And she's also getting help with her rent from a non-profit. Last year, she was homeless. She had an accident. She lost another job and was evicted. So every night, she told me, she drove her car to Lake Pontchartrain. WILLIAMS: And I'd just go around it and, like I said, park some where it was real, real dark. You know, just relax and - well, try to relax and just fall asleep. FESSLER: So the obvious question is, if things are so bad, why doesn't she get welfare, now called Temporary Assistance for Needy Families, or TANF. Williams says it's because it's just not worth it. The benefits are extremely low, $188 a month. And to get them, she says she'd have to take time off from her current job search to go to a program to find out how to get a job. And until last month, she was working, even while homeless. She just didn't earn enough to live on. WILLIAMS: Why look for a job if I already have a job? Why can't I just get a little help? It didn't really make sense to me. DANIELLE MOLETT: All this is your school supplies right here. FESSLER: It also doesn't make sense to Danielle Molett. She's 22 and lives nearby in a shelter with her three children, ages 4, 3 and 2. Molett does get welfare and appreciates the extra cash. But this month, it barely covered the school supplies she had to buy for her kids. MOLETT: Crayons, markers, pencils, headphones, notebooks, notebook paper. FESSLER: And she still has to get diapers, hygiene products and other necessities she can't buy with food stamps. But to qualify for the aid, Molett says she has to pack up her children, get on a bus and travel to two appointments a week and look for a job. The state gives her some money for transportation and childcare, but not enough to cover her costs. MOLETT: It's too much. They asking for too much. FESSLER: Marketa Garner Walters is sympathetic. MARKETA GARNER WALTERS: We're not the most accessible or user-friendly. FESSLER: She's the new secretary of Louisiana's department of family and children's services. GARNER WALTERS: We have to figure out how to meet our clients where they are and how to make the help that we are giving them more accessible and readily available. FESSLER: Walters says one problem is, over the years, welfare spending in the state has been slashed. The law that Bill Clinton signed allowed states to use federal TANF funds for things other than welfare. And when state budgets were stressed after the Great Recession, that's exactly what many of them did. GARNER WALTERS: So we now use TANF money to pay for things that are not traditional TANF expenditures. FESSLER: Like early childhood education and other programs that used to be funded by the state. Jan Moller of the Louisiana Budget Project says welfare became something of a slush fund. The result is that, today, Louisiana uses only 8 percent of its welfare money on cash benefits for the poor and only 1 percent on programs to help them find jobs, one reason that benefits are so low. JAN MOLLER: I think there is a perception among the tax-paying public that a lot of their dollars are being used to let people sit at home and not work. And the reality is that simply isn't true in Louisiana. It wasn't very true 20 years ago, and it's certainly not true today. FESSLER: Secretary Walters says the state's now trying to replenish the program. But Moller's not optimistic it can find the funds. Ron Haskins of the Brookings Institution who helped write the welfare reform bill as a GOP congressional aide now thinks giving states so much flexibility was a big mistake. But he says the law did accomplish a lot, such as helping millions of low-income women into the workforce. And with the help of food stamps and tax credits, their poverty rates have gone down. RON HASKINS: More of them, now, are really committed to work. They like to work. They say they like to work. They don't have great jobs - we all know that - but their families are better off economically. So to that extent, the reforms have worked well. FESSLER: Still, he admits that many families have been left behind. Often, they're headed by single mothers who work part-time jobs and get little or no help from the fathers. They face multiple hurdles, like unstable housing, poor education and debt, people like Natasha Williams, who says she sometimes gets overwhelmed trying to support herself and her son. WILLIAMS: You know, I have to go sit outside in the car and cry or, you know, wait for him to go to sleep and go in the bathroom and just cry my eyes out because I can't let him see me like that 'cause that's going to just mess him up. GREENE: Listening there to my colleague Pam Fessler reporting on welfare reform 20 years later. And that voice of that mother, Pam, just sticks with me. I mean, talking about her boy who is going to grow up in poverty - that has to have long-term consequences. FESSLER: That's right. That's the big concern, whether the cycle can be broken. This afternoon on All Things Considered, we're going to look at how welfare works in another state Oregon. That state has a benefit that's much higher, among the highest in the country. And they also have a special program to help people get and retain jobs. GREENE: OK. Pam, thanks a lot. FESSLER: Thank you. Transcript provided by NPR, Copyright NPR.